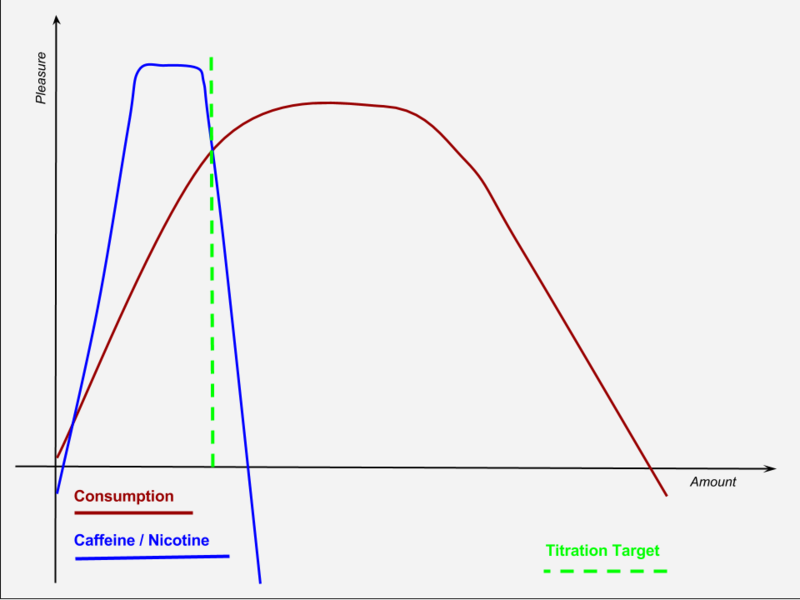 The existence of self-titration of nicotine when smoking is pretty well established scientifically. It’s easy enough to get reliable figures by measuring the nicotine level in the blood. But often the established level differs from that measured when the smoker could consume his customary fare. This difference is even more pronounced when testing vapers. I’ll try to illustrate possible reasons for this discrepancy and present an easily overlooked, but very important new mode of self-titration that appeared with vaping and may be quite disruptive to testing the customary mode of self-titration. 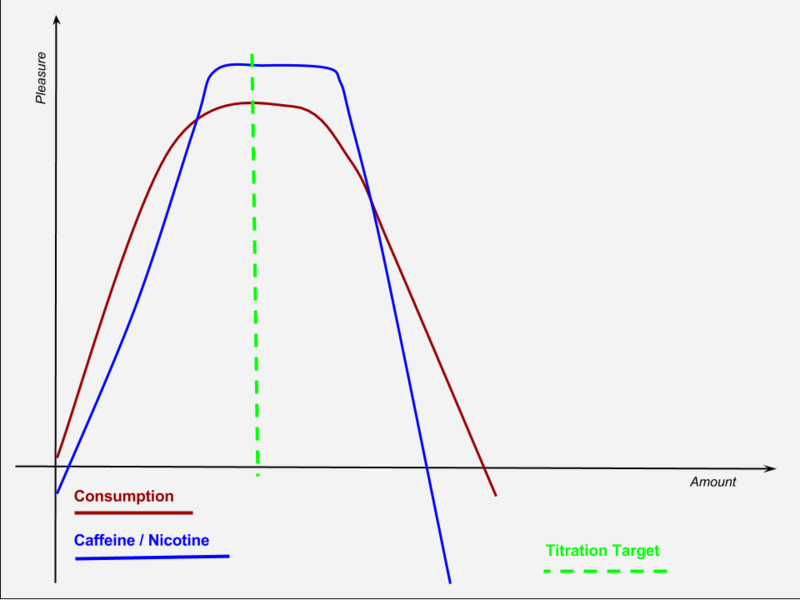 The illustrations are only to visualise the concept of the different kinds of pleasure derived depending on the amount ingested and how they may influence the point where self-titration stops. They are not based on actual data. Habitual alignment of the pleasure derived from caffeine / nicotine and the pleasure of ingestion by itself. Besides nicotine there is another stimulant people are used to self-titrate, but seldom call it thus: Caffeine! Everybody knows somebody who states something like “Don’t talk to me before my first cup of coffee!” These people are routinely self-titrating caffeine. They drink enough coffee to reach an agreeable level of caffeine in the morning. Then they simply drink enough to keep it comfortable. But there’s more than just the caffeine. Besides the sensation of drinking the hot liquid itself, a very important component is the taste. It’s the main reason for the success of the specialised shops offering all those fancily flavored variations. Enough people don’t want the caffeine, but still like to indulge in this pleasure, so that there is a market for decaffeinated coffee. Unfortunately these other pleasure factors aren’t as easily and reliably quantified as the blood plasma level of caffeine / nicotine. They are very subjective and can only be estimated by questioning the subjects. Self-titration when the caffeine / nicotine level is lower than usual. A caffeine junkie will soon notice when that first cup was decaf or caffeine reduced. Something is missing. So he drinks more. But there soon comes a point where—independent of the caffeine level reached—drinking more becomes too uncomfortable. Then he stops drinking the too weak stuff, even if his desired caffeine level isn’t reached yet. This also works for unexpectedly strong coffee. When the caffeine level gets too high, it becomes increasingly uncomfortable (dizziness, headache, cold sweat, palpitations, …) and the consumption is automatically suspended until the discomfort is gone again. For nicotine it works similarly. And—contrary to a claim that keeps getting repeated like a mantra—there is some pleasure from smoking by itself, independent of nicotine. When given cigarettes with less nicotine the smoker will automatically use compensatory puffing to get closer to the desired nicotine level. For this he will inhale longer and deeper, draw harder, smoke more. But—just like drinking coffee—this excessive smoking will at one point become more uncomfortable than the missing nicotine. A new mode of self-titration! 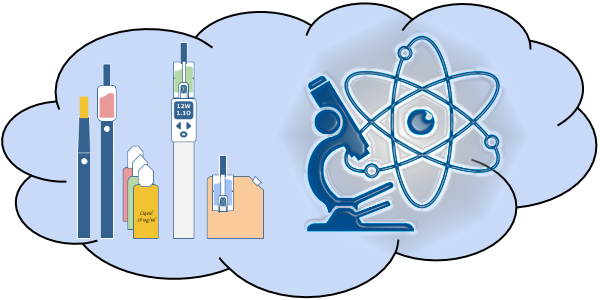 Vapers have a whole new different mode of conscious self-titration: Selecting the nicotine content of the liquid! Vapers soon find out, which amount of nicotine suits them best. But they don’t have to adjust the amount of vaping from what they like best. They simply choose the nicotine content of the liquid higher or lower, so that in the end they get their desired nicotine level while they also get the most pleasure from the rest of the vaping experience. 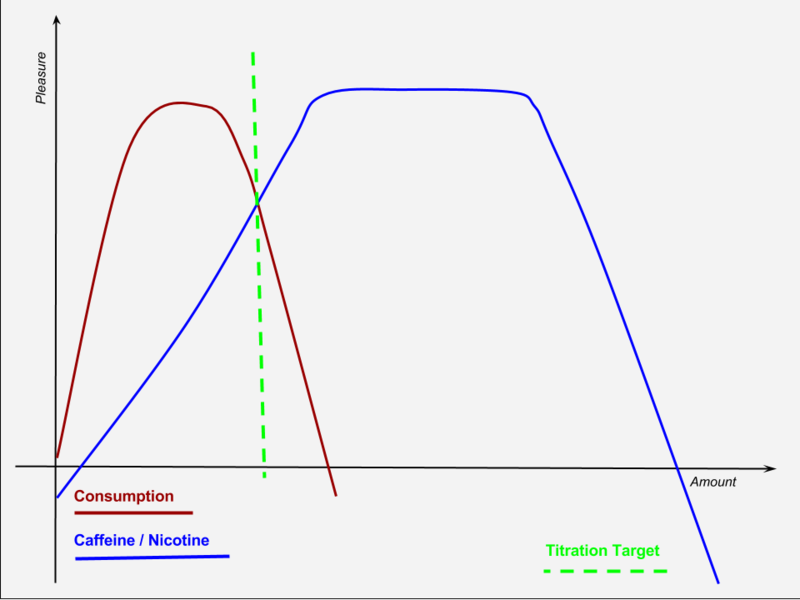 Self-titration by selecting the nicotine level to fit the desired behavior. The (subconscious) consequence of this new decoupling is, that the pleasure of vaping (independent of nicotine) can become a much more important factor than it ever was with smoking. It can be optimised now independently. When I was a smoker I had to find a compromise. The amount of smoking was rather tightly coupled with the nicotine consumption. And—with all the Fancy Flavors playing an important role—vaping by itself can provide much more pleasure than smoking. With this significant increase of the relative weight of the other pleasure factors it seems logical that when compensatory puffing is employed, the equilibrium of displeasure of too much vaping and missing nicotine is reached at a much lower nicotine level. There may be more! It is also quite possible that the nicotine level by itself loses some of its importance for long term vapers. Consider the many anecdotes of Diminishing Dependency. When vapers can forsake the pleasure of vaping much easier than they ever could skip smoking, it stands to reason that an acceptable nicotine level is much lower in compensatory puffing. Some vapers even find that they don’t care for nicotine and continue vaping completely without. Just for the pleasure of the experience itself. One obvious conclusion is: From a purely medical point of view it would be better to use higher nicotine concentrations in low power devices to minimize the inhalation of additional, possibly detrimental substances. But this only addresses the physical health aspect. It totally ignores all the other important reasons to vape or smoke, that can be summarized as Pleasure! Since with vaping these other factors gain more importance, many vapers don’t care for an advice that would drastically reduce the experienced pleasure. No matter how sensible it might be from a health perspective. Especially when the possible dangers are just vague gut feelings based on common sense instead of solid data. Most pleasurable activities defy common sense. Addition: Thanks to Dr Brian Carter for pointing out that I have missed an important point concerning compensatory puffing. When compensatory puffing is discussed, the unspoken assumption is that only the nicotine content is a relevant variable. But that can only be true if all the other aspects are kept constant. Taste, temperature, density, visual response, other sensations — all these variables the smoker or vaper might try to compensate when presented with an unfamiliar alternative. How much of the compensatory puffing is for the nicotine and how much is due to the other factors that define the total experience? Just consider the coffee drinker. If you simply dilute his regular coffee with the same amount of water, he’ll surely do some compensatory drinking. But how much of that is due to the lack of caffeine and how much is an attempt to compensate for the missing taste? My own experience as a former smoker tends to confirm this. I enjoyed smoking a small local brand with slightly (~15%) below normal nicotine and tar levels, but a very distinct and rather rugged taste. When I had to resort to regular, smoother brands, I actually smoked more despite the increase in nicotine and tar. Missing the ruggedness of the taste. So, compensatory puffing certainly isn’t as exclusively focused on nicotine as commonly assumed. It’s by itself rather multidimensional with a lot of confounding variables. 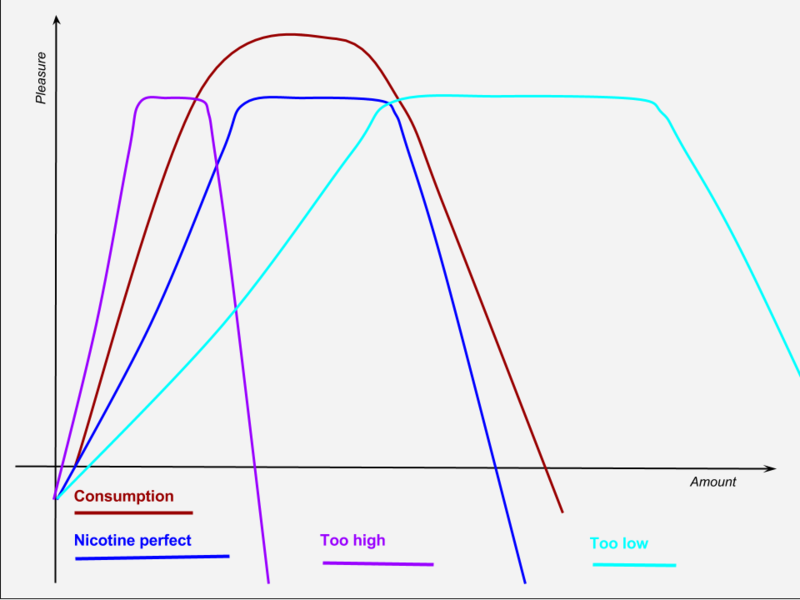 The resulting nicotine and cotinine content is only a measure of the amount of compensatory puffing, but can’t be taken as proof for exclusive causation by nicotine compensation. I also had started to write a bit about Delusional Denialists, but that turned into an unscientific rant and I moved that part into a separate article. 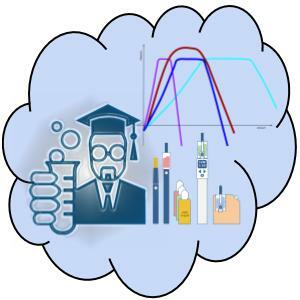 Self-titration by experienced e-cigarette users: blood nicotine delivery and subjective effects. You KNOW, NZ….my respect for you is immense! Taste and aroma are also important confounders in pipe and cigar smoking. Also, when the smoke is not inhaled nicotine absorption is through the bucal mucosa, so it is a much slower (and less acidic) process than with cigarettes. The puffing saturation effect that you describe also happens with cigars/pipes. In some ways vaping resembles more cigar/pipe smoking (specially pipe smoking) than cigarette smoking. Vaping came extremely natural to me as a cigar/pipe smoker who does not inhale the smoke and thus enjoys the taste/aroma. Since I don’t inhale the vapor, I simply incorporate to the new habit the taste and aroma sensation of the old one.